Feel the nip in the air? Summer fades and autumn arrives to transform the forest canopy into an artist’s palate. Hunters, campers, and hikers are gearing up to enjoy the great outdoors. Winter is on the way and many of your favorite edible and medicinal plants will fade into the landscape. But trees, they’ll stick around all four seasons. Now is the time to locate these valuable resources before their foliage covers the forest floor. You may have a favorite season to tramp in the woods. For me, it’s Fall, Winter, Spring and Summer! Journal the location of these valuable resources. With the exception of evergreens, the only obvious identifying characteristics in the winter months will be the tree bark. In this 5 Part Series, we’ll cover my top 5 useful trees found in the Eastern Woodlands; more specifically, in my home state of Georgia. These may be in your neck of the woods too. First up, a tree that is ease to identify year round. Let’s start with North America’s most familiar and successful conifer, pine trees. Whether you’re from the south or not, you know a pine when you see one. There are 36 pines in North America to choose from. To narrow down the species, count the needles. 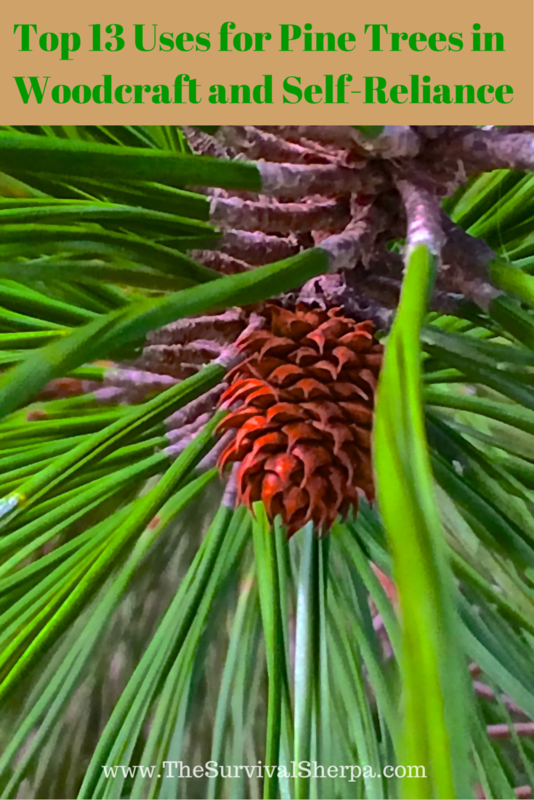 The Eastern White Pine (Pinus strobus) is the only species with 5 needles in the fascicle sheath (the paper-like sheath surrounding the base of the needles). I’m just south of their natural range and haven’t had much experience with this variety. This tree is touted as the king of Vitamin C. But all pines are useful medicinally. Medicinal Properties include: antiseptic, astringent, inflammatory, antioxidant, expectorant, high in Vitamin C for colds – flu – coughs, congestion, and even scurvy. Shikimic acid, the main ingredient in Tamiflu, is harvested from pine needles in Asia. A.) Pine Needle Tea: Drink a cup of pine needle tea to extract the useful stuff when you feel flu-like symptoms in your body. More research can be found here. Add a few pine needles to a cup of boiled water (Don’t boil the needles in the water as this will release un-tasty turpenes). Allow to steep for 3 to 5 minutes. Add natural sweetener if you like. I prefer pine needles only for a Vitamin C boost! B.) 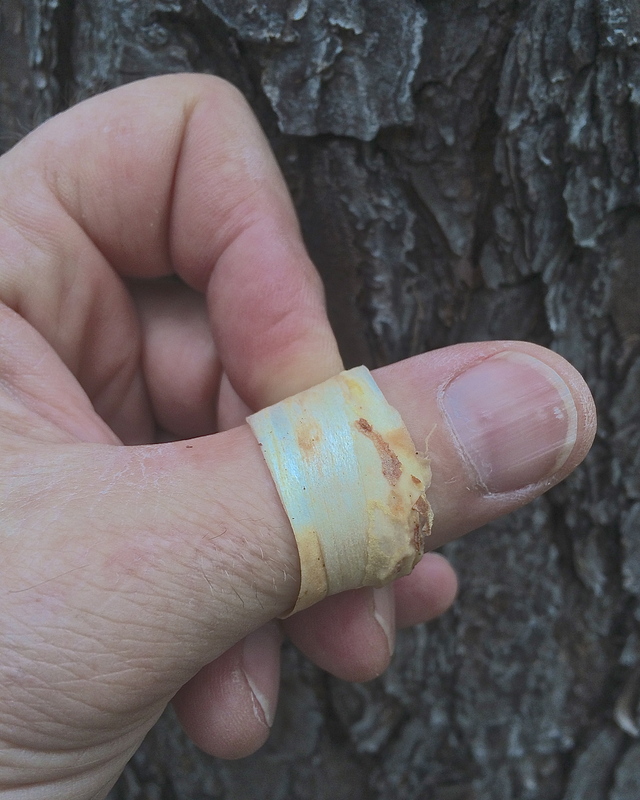 Pine Bark Band Aid: The inner bark can be fashioned as an antiseptic Band Aid for cuts and scraps. Apply to wound and secure with duct tape, bandana, or cordage. 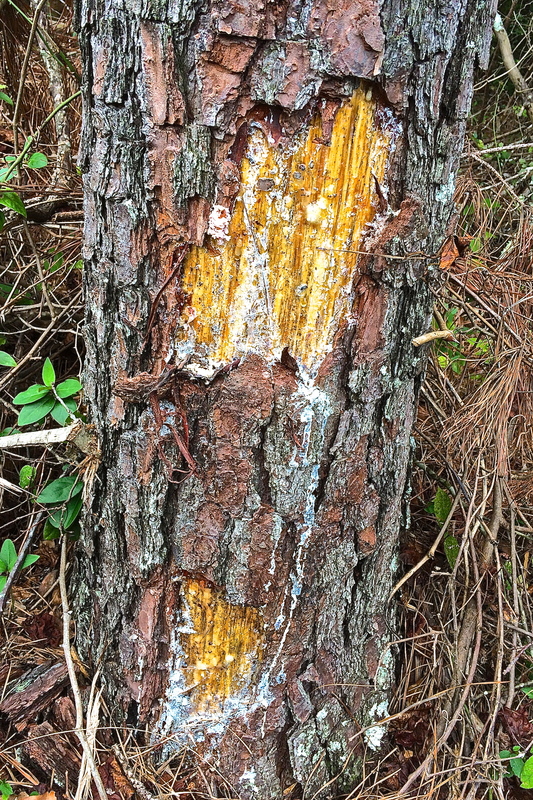 C.) Pine Sap/Resin: This sticky sap can also be used to cover wounds, blisters, and burns. Collect hardened sap from a wounded tree and heat it to make it pliable. Mowers recently clipped this tree on a power line. The white streaks are pine sap. Older sap is easier to collect when it forms an amber “ball” at a wound. D.) Pine Pollen: The yellow pine pollen that blankets the south in the spring is actually beneficial, not only for pine tree reproduction, but also for boosting our energy levels with small levels of testosterone. Arthur Haines describes on his YouTube channel how pine pollen provides multiple avenues of protection against radioactive cesium. The endogenous antioxidants that are promoted by pine pollen are protective of DNA against radioactive particles. E.) Bug Dope: “Nussmuk” (George Washington Sears) described his effective insect repellent in the North Woods with its main ingredient being pine resin. Once applied, a bronze protective film gave his skin weeks of protection from pesky biting insects. F.) Firecraft: Fat lighter’d (fatwood, lighter wood, fat lighter, pine knot) is in every fire kit I own. 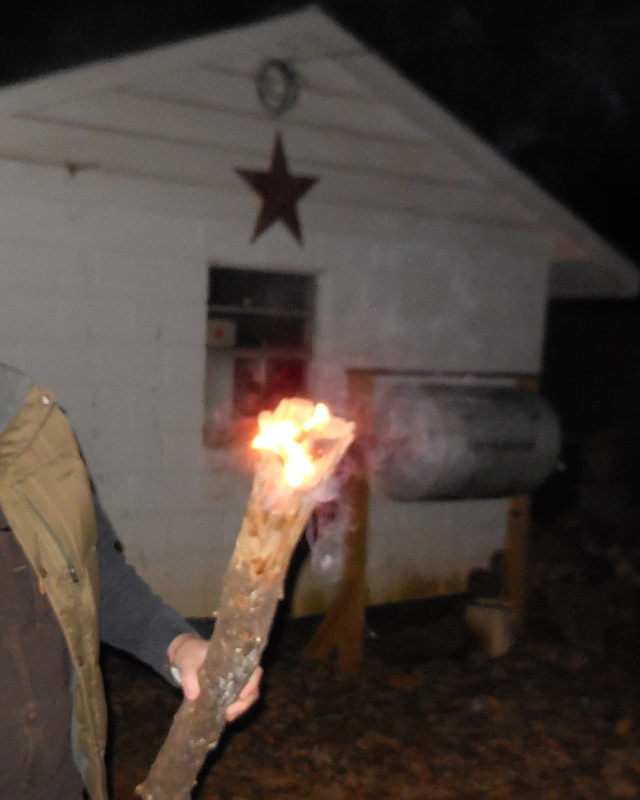 It’s plentiful in Georgia and hard to beat as a natural fire starter/extender – especially in wet conditions. Shavings from fatwood will ignite with a ferrro rod. G.) Pine Bark Bacon: Inner bark is edible . 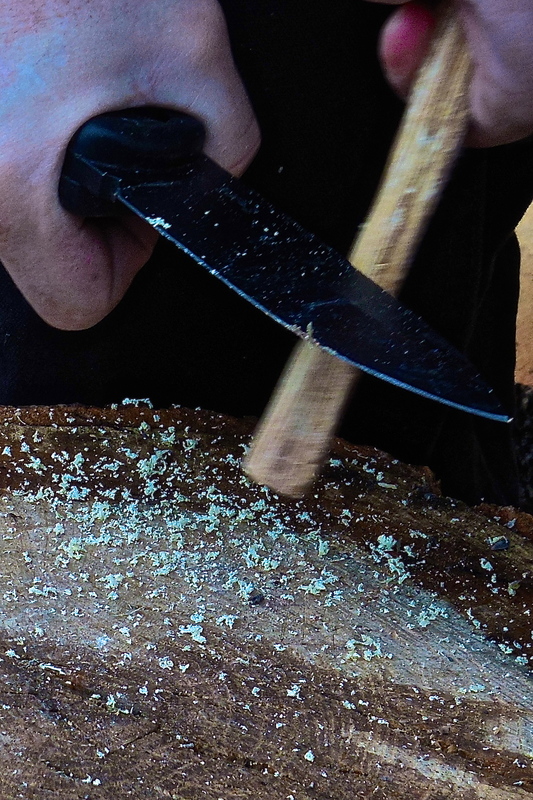 Check out this woodsman at Survival Topics frying pine bark like bacon! I.) Pine Pitch Glue: Used for hafting arrowheads, fletching arrows, patching holes in tarps, seal containers, fire extender, waterproofing equipment – really, any stuff that needs adhesive. J.) Illumination: Fat Lighter’d torches are simple to make and adds light to your camp or night-time trek. K.) Hugelcultur: Dead wood in hugelcultur beds acts as a water retention sponge to help build food independence and self-reliance. Want to build one? One of our Doing the Stuff Network members shows you how Here. L.) Signaling: To alert rescuers, a pre-made signal fire built with green pine boughs on top will generate enough white smoke to be seen for miles. M.) Firewood: Burning pine on your campfire won’t produce BTU’s like hardwoods, but will keep you warm and cook your coffee. Plus, piney forests are littered with an abundance of dead limbs for fuel. The carpet of dead needles can be gathered for tinder material. The lowly pine is listed first in our series for a reason. As you can see, its uses are many… too many to list here! Please add to the list in the comments anything I missed (I always miss something) to help us learn from each other. Next up in the series: White Oak. Todd tell me more on this Bug Dope man. 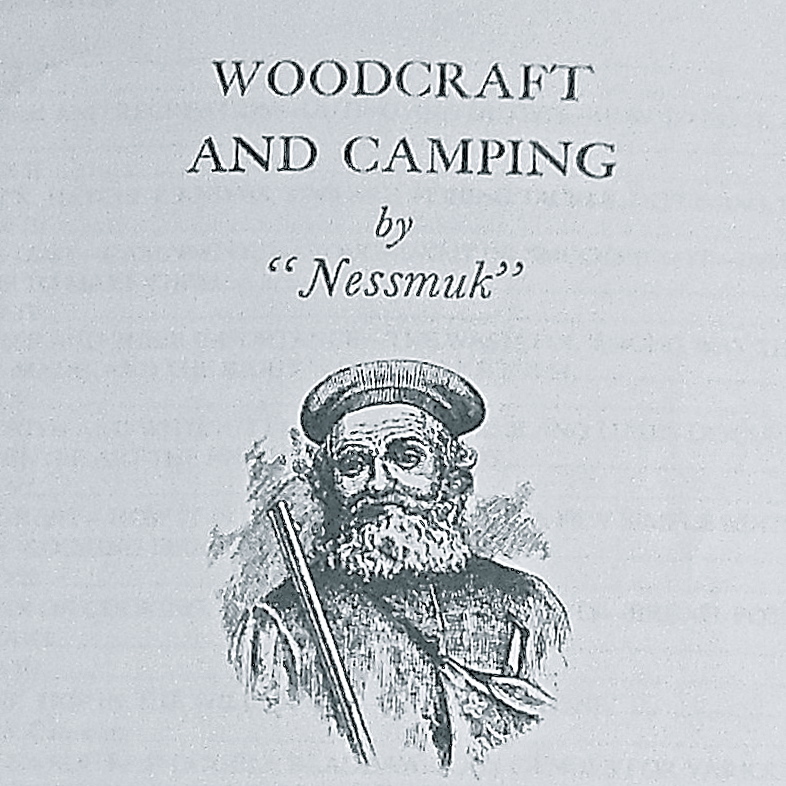 Nessmuk’s recipe consisted of 3 parts pine tar, 2 parts castor oil, and 1 part pennyroyal oil. When I try to make it, I’ll substitute tea tree oil for the pennyroyal as my research found negative review on the pennyroyal. Hope this helps, James. Good to hear from ya, brother! Added you to our Trusted Resources page… thought you were already on there… my bad on that one. Thank you, I grew up in South Ga. The terpintinestills had closed down. Question how can I distill or make terpintine? I run a tree service. No one wants the pine. I chip the limbs and use the mulch in my berry patches because of the high acid content. I also make Swedish chimneys out of the pine logs. My customers love them. You can look up Swedish chimney on you tube, maybe, and see how they’re made. If you can’t , maybe I can post something. I’m curious… Have you tried pine bark bacon or have eaten it like potato chips? It’s hard for me to grasp eating wood because it makes me think that wood in your stomach wouldn’t be good for you especially if in a survival situation where you don’t want anything going wrong. I have not, John. Many Native American tribes ate inner pine bark to sustain them through winter time when other reliable sources were no longer available. Well sir, there’s only 1 way to find out I reckon. Lol I’ll let you know after I try it, if there’s anything you should look out for and if it’s even tasty! Would love to hear your report! I remember when a teen, I would go out in the logging areas looking for stumps. The ones that have been there for years. They turn green and are hard as a a rock. We would bust the roots best we could and wrap a chain around to pull them out of the ground with 4×4. Split them up with hydraulic wood splitter to about 5 in. in diameter. You can then use a hatchet or bowie knife to split into smaller pieces. Great for fire starter. Just as good if not better than pine knots. You’re right about the stump being slam full of resin. You can also render the roots down to collect pine tar. Thanks sharing, Carl! Had a Native grandma tell me they coated their moccasin soles with layers of pitch and sand for waterproofing and traction. She was from Eastern Oregon. I’m from western Washington and finding dry wood can be challenging. Rotting spruce logs can be broken up and the limb knots are pure pitch. One of our beaches sorts these knots into deposits and I bring a few home when I beach walk.